Long wars are characterized by three qualities which determine their duration, intensity and scope; Form of Combat (operations), Strategy, and Ideological Foundations – with Strategy linking Combat to Ideology. A firm and unassailable ideology informs the formulation of a set of strategies which will effect intense and enduring combat operations capable of defeating an enemy, or exhausting an adversary through a long war into finally abandoning military campaigns. Ideology and Legitimization of Violence. Al-Shabaab has repeatedly cast itself as the defender of the lives, rights and aspirations of the Muslim Populace in Somalia and Kenya; besides assigning themselves the responsibility of safeguarding and defending the honor of Islam and Muslims (albeit, according to its own interpretations and exegeses) – elements which feature prominently in its audiovisual release entitled Avenging the Honor of Our Prophet- Storming the Burundian Crusaders’ Base Leego – Lower Shabelle, which shows the decimation of an AMISOM Military Base in Leego, Lower Shabelle. This video serves to rationalize and legitimize the insurrectionary campaign that Al-Shabaab is presently conducting in Somalia as well as serve as a propaganda piece to demoralize AMISOM forces, besides alluring Somali civilians to join their cause. In June 2015, Al-Shabaab conducted a series of bold and devastating offensives against AMISOM forces which left over 150 AU (African Union) troops’ dead across the battlefields of Somalia; alongside another 6 dead Kenyan soldiers who were killed in Baure area of Lamu County, Kenya. The Climax of AlShabaab’s Ramadhan Offensive was the capture of an AMISOM Forward Operating Base (FOB) near Leego town in Lower Shabelle. Salient Utilization of OSINT (Open Source Intelligence) Data. On 7th July 2015, SIF utilized OSINT sources, coupled with appropriate deductions, to reconstruct the events surrounding the Fall of the FOB in Leego to Al-Shabaab; and thereafter published the reconstructed version of events as a post entitled Fall of Leego's AMISOM base – Primer to Al-Shabaab Offensive in South-eastern and Central Somalia. The version of events published by SIF have been authenticated, validated and confirmed to be true by the video of the attack released by Al-Shabaab – though Al-Shabaab omitted showing some noteworthy events; partly to conceal its modus operandi, and partly to protect the population from AMISOM’s retribution. One of the events omitted from the video was the fact that the residents of Leego welcomed and celebrated Al-Shabaab’s victory over AMISOM troops – which reveals that AMISOM lacked (and still lacks) popular support in parts of Southern Somalia. The attack on Leego was a culmination of a series of occurrences which are discussed below. Derision (On June 1st, 2015). On 1st June 2015, President Yoweri Museveni – speaking at Nyayo National Stadium in Nairobi, during Kenya’s Madaraka day – derided Al-Shabaab for lacking the capacity to attack police stations and military bases; and cautioned the jihadists that they were nearing defeat as they could not face off armed security personnel. Earlier on, Museveni had penned down an article in Uganda’s New Vision arguing that Al-Shabaab was all but defeated. SIF assesses that Al-Shabaab interpreted these statements and arguments as a challenge; a Challenge they were ready to take. [On September 1st, 2015; Al-Shabaab jihadists decimated a Ugandan Military Base in Janaale killing an estimated 50 soldiers and capturing scores of troops]. The war against Al-Shabaab is qualified by imprecise intelligence provided by the CIA (Central Intelligence Agency – America’s Leading Intelligence Agency headquartered in Langley, Virginia), which SIF assesses to have produced erroneous Intelligence reports which consciously downplayed the offensive capabilities of Al-Shabaab as well as lessened the magnitude of the threat it posed to both Somalia and Kenya. This miscalculation was quickly exposed on 11th June 2015 when Al-Shabaab killed over two dozen Ethiopian soldiers in Beledwyne. A Connected Event – Decimation of an Ethiopian Military Convoy. 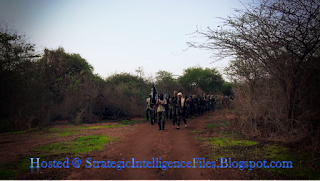 In the afternoon of June 11th 2015, Al-Shabaab militants - belonging to the newly formed Sheikh Abu Zubeyr Battalion - ambushed and decimated an Ethiopian military convoy in Beledweyne. In a report published by the Long War Journal, the jihadists claimed that they successfully ambushed the convoy, and engaged Ethiopian troops in a fierce battle which culminated with the Ethiopians fleeing the battlefield and abandoning their military hardware after the mujahedeen killed dozens of Ethiopian soldiers. A relief convoy sent to assist the ambushed convoy was also destroyed by Al-Shabaab. In a prior post published here, SIF assessed that the number of fatalities Al-Shabaab claimed to have afflicted on the Ethiopian Military were exaggerated; as most Ethiopian soldiers fled the battle relatively unhurt - a fact proved right by the video depicting the Fall of Leego where one of the Ethiopian Soldiers who had escaped was killed by Al-Shabaab alongside Burundian soldiers. 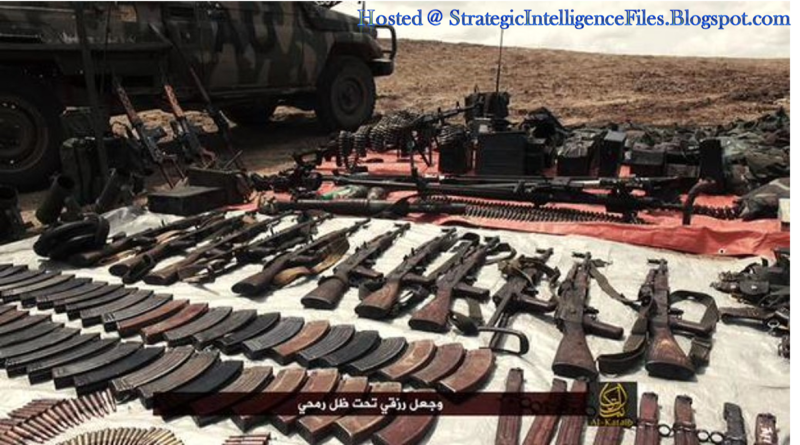 Most of the weapons captured by Al-Shabaab from the Ethiopian troops during the ambush were put into effective use in storming AMISOM's Forward Operating Base in Leego. 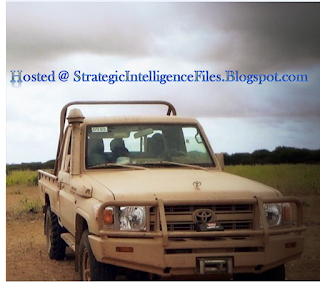 An AU 4 × 4 Toyota Technical Captured by the Mujahideen of Al-Shabaab from Ethiopian Troops. Photo credit: Al-Kataib. 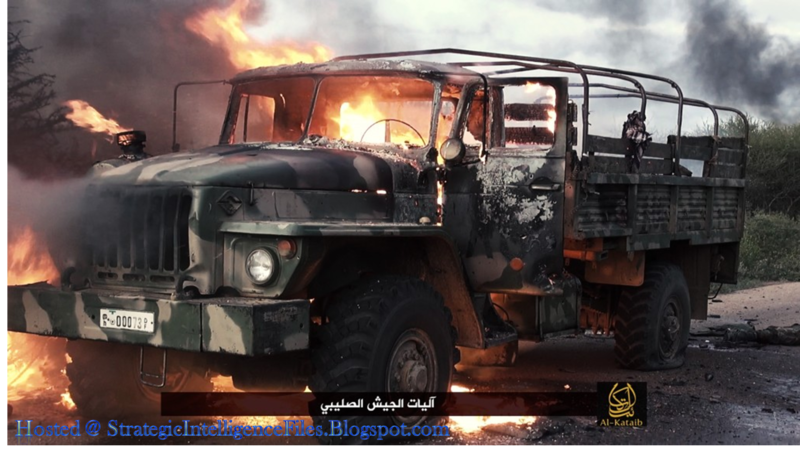 Al-Shabaab displays its Ghaneema (Spoils of War) after destroying an Ethiopian Armoured Convoy. Photo credit: Al-Kataib. Eid-al-Adha Message or a Veiled Threat directed to the Holy See. On 24th September 2015, Al-Shabaab released a video depicting its raid on the Burundian Military Base located on the outskirts of Leego town. Coincidentally, the day of the release coincided with the Muslim Festival of Eid- al-Adha (Feast to commmmorate the sacrifice of Ishmael); and the Media has interpreted such coincidence as Al-Shabaab’s Eid-al-Adha message to the Muslim Umma and the World at large. 1. To show that Al-Shabaab is integrally rooted in Al-Qaeda, and are ready and capable of fulfilling the pledges made by its slain Emir (albeit posthumously). 2. To enflame the passions of steadfast Muslims who revere their prophet, and in so doing, enjoining such Muslims to their cause besides legitimizing their actions. 3. Create fissures between Muslims and Christians by depicting Christian leaders (who most Muslims consider to the Roman Catholic Pope and his pontificate) as inherently hostile to Islam; and always conspiring to destroy Islam. Snapshot of the Video. Photo credit: Al-Kataib. The high-quality, slick and superbly-edited video is produced by Al-Kataib Media Foundation – the Flagship media arm of Al-Shabaab. The 27 minutes 10 seconds video is compact with its planar encoded format effecting high-resolution visuals and clear audio; though its denuded metadata avails no meaningful clues (in terms of production location and tools used) with regards to forensic analysis. 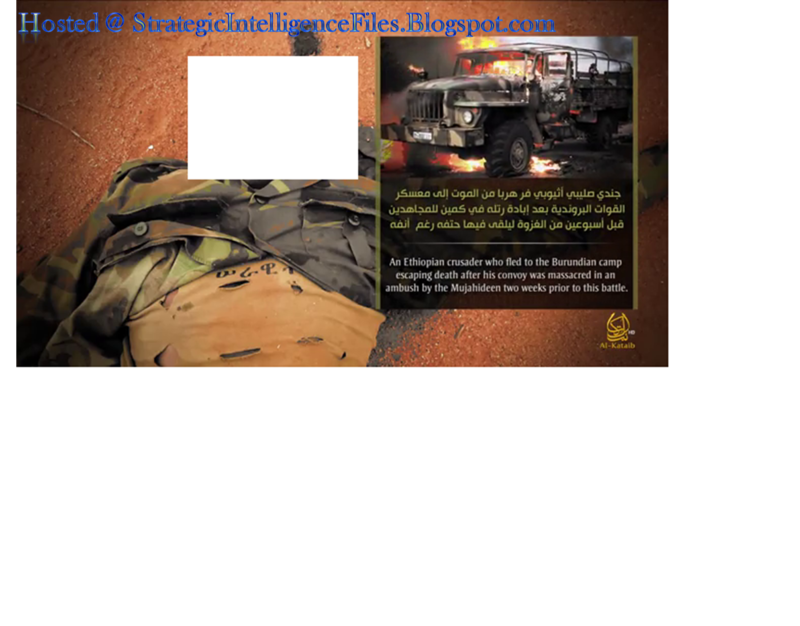 Similarly, the video features split screens, especially towards the end where the screen is split into four unequal sectors with each sector showing a slain AMISOM soldier. Stephen Harley was also able to make out three cameramen in the video. The graphic and thrill-filled video shows the progress of the attack from its commencement, to its termination when the mujahideen retreated to their rural bases with their ghaneema (Spoils of War). 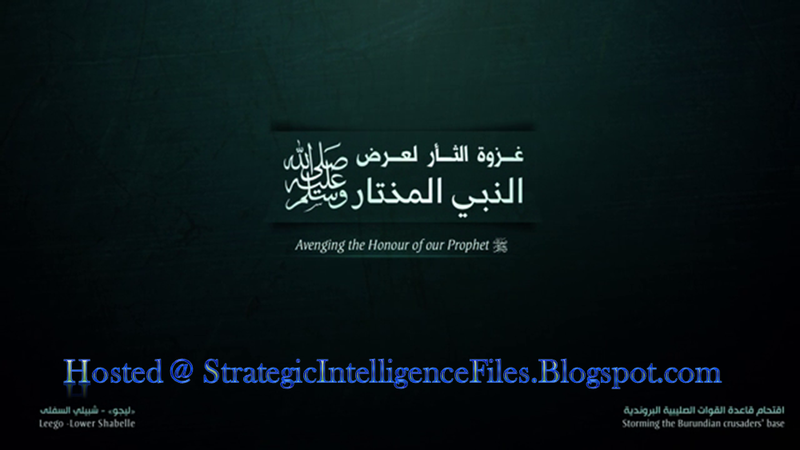 Judging from the Arabic script and transliteration used in the video, SIF concludes that the editing was done by a Saudi or an entity well-versed with Hejaz-Arabic. 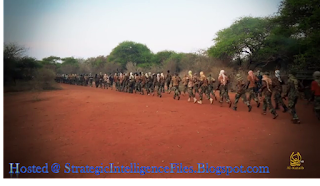 After the short provocative speech by Osama bin Laden, the video shows hundreds of masked Al-Shabaab fighters jogging around at an undisclosed training area (which SIF assesses to be in Lower Shabelle). 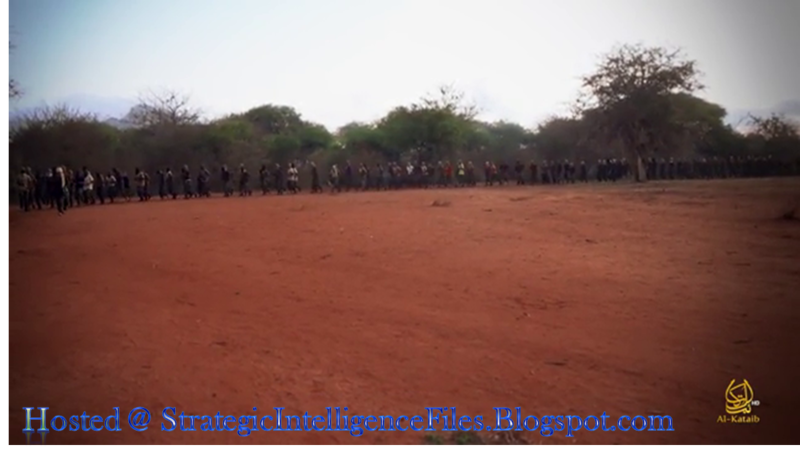 Hundreds of Al-Shabaab Militants jogging around in Formations. Photo credit: Al-Kataib. The nasheed playing in the background – which is rudely interrupted by a brief speech given by the Slain Sheikh Abu Ramla Mohammed Ahmed Roble (alias Boqolsoon) in his exasperatingly harsh and quick-paced Somali accent - at this instance is Malakna Haza-ud-Dunia Al-Quroon. 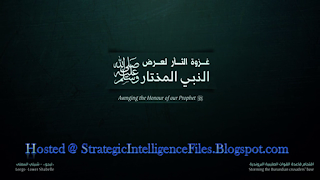 This nasheed has been featured repeatedly in video released by Al-Qaeda in the Arabic Peninsula, and SIF attests that its inclusion in the video is meant to implicitly confirm Al-Shabaab’s allegiance to Al-Qaeda. Hundreds of Al-Shabaab Militants training on an Open ground. Photo credit: Al-Kataib. One can also make out an Ural Military Truck – usually used by Ethiopian troops - parked adjacent to the jogging ground. A Portion of the rear part of an Ural Truck - along with the right rear wheels - can be seen as the Mujahideen jog past it. Photo credit: Al-Kataib. Al-Shabaab is known to have captured military trucks from Ethiopian forces, besides decimating Ethiopian supply and transport convoys. An Ethiopian Ural Military truck burnt down by Al-Shabaab in Beledweyne on the 11th of June 2015. Photo credit: Al-Kataib. At Kismayo Airport, Aden Adde International Airport in Mogadishu and at another undisclosed location in Southern Somalia, CIA and JSOC (Joint Special Operations Command) jointly operate several drone base stations. These stations serve as the command-and-control centres for armed UAV (Unmanned Aerial Vehicles), and surveillance drones. Nonetheless, none of these UAVs – which constantly patrol the airspace of Lower Shabelle in combat missions to detect, locate and destroy Al-Shabaab bases – was able to detect such a large assembly of Al-Shabaab militants in Lower Shabelle. Based on the video, the militants trained on relatively open grounds without fear of being discovered and destroyed. According to SIF, the relative freedom exercised by Al-Shabaab to assemble an entire company in open grounds shows the absolute flexibility enjoyed by the jihadists in their rural strongholds; as well as ascertain AMISOM’s operational inaptitude and strategical inadequacies in managing rural-based insurgencies. The video then progresses to the Istishhadi (Suicide Bomber) who blew himself up. 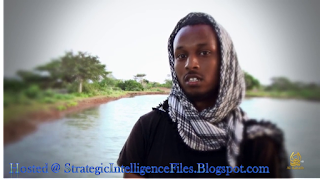 The suicide bomber is a young Somali male named Amar Osman Axmed – a member of the Hawadle sub-clan. He is first shown reciting several verses from the Quran before being interviewed as he stood on the bank of an artificial dam. He then acknowledges his conscious acceptance of the suicide mission tasked on him. Amar Osman Axmed on the banks of an Artificial Dam in Lower Shabelle. Photo credit: Al-Kataib. Al-Shabaab provides a brief biography of the suicide bomber; stating that he worked in the Health Department of the organization, tending to the injured fighters, and concludes by asserting that he decided to volunteer for a suicide mission whilst nursing the injuries of fellow jihadists. Next, Amar is shown praying at night, moments before he blew himself up using an SVBIED (Suicide Vehicle-Borne Improvised Explosive Device). Amar Osman Axmed prays moments before he executed his Suicide Mission. Photo credit: Al-Kataib. SIF assesses that Al-Shabaab mentioned the clan of the Istishhadi in order to demonstrate that its ideology transcends clan loyalties and regional politics. Likewise, SIF can confidently reveal that the SVBIED used in the attack was a captured 4 × 4 Toyota Pick-up truck laced with explosives similar in make and model to the one shown below. The SVBIED utilized a vehicle similar to the one shown above. Photo credit: Strategic Intelligence Files. According to SIF, one of the Core enablers of Asymmetric warfare is mobility. Mobility allows militants to move fighters, transport utilities and weaponry with relative freedom thus providing them the critical latitude to move freely while avoiding detection - thereby affording them the opportunity to conduct surprise strikes on enemy positions. As such mobility complements and augments operational flexibility, and also preserves the vital element of surprise. Another component which augments mobility and the element of surprise is Movement by Night. Even so, Movement by Night requires the militants to have good knowledge of the ground which in turn necessitates the need for prior reconnaissance and rehearsals for an attack. 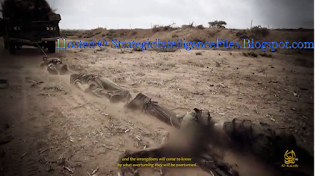 Al-Shabaab launched their offensive at around 0500hrs local time, and from the evidence presented in the video; it is quite clear that despite their qualitative offensive power, AMISOM troops have still not yet mastered the art of rural counter-insurgency. The Burundian soldiers based at the base lacked popular support, neglected foot-patrolling and had neither mastered the terrain nor exploited their technical superiority to their advantage. In the end, Al-Shabaab was able to move in an entire company of militants into the area undetected. The movement was done at night in order to maximally exploit the cover of darkness to conceal the movements as well as maintain the element of surprise. The Istishhadi detonates his SVBIED. A convoy of three 4 × 4 technicals drive towards the base. This is followed in rapid succession by intense gunfire from small-arms, light machine guns and heavy machine guns mounted on the 4 × 4 technicals as depicted in the video clip below. In the clip, one can count four different 4 × 4 technicals with the one captured from the Ethiopians at Beledweyne shown towards the end of the clip. The aforementioned technical captured by Al-Shabaab is shown below. An AU Technical captured by Al-Shabaab. Photo credit: Al-Kataib. The AMISOM Technical being used by Al-Shabaab to attack the Burundian base at Leego. Al-Shabaab foot soldiers storm the base. AlShabaab Militants inside Leego's FOB. Jihadists use Machine Guns to dislodge AMISOM soldiers from their remaining positions. AMISOM soldiers abandoning their positions and fleeing from the Base. 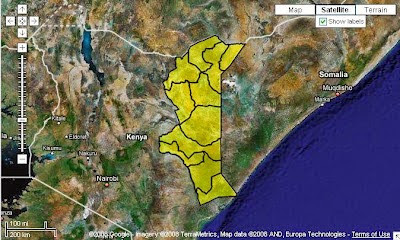 Ultimately, the jihadists capture the entire base…..
Al-Shabaab gains total control of AMISOM’s FOB in Leego. The FOB’s Makeshift Church being Despoiled. Al-Shabaab Jihadis pillaging the base. And one of the Field Commanders was a Kenyan Mujahid …. In June 2014, Al-Shabaab jihadists entered Lamu County, Kenya; and conducted a series of attacks which enabled them to overrun several police stations, obtain Kenya Army uniforms, and capture weapons; besides massacring non-Muslim Kenyan civilians. Laughable analysis from Kenya’s National Intelligence Service (NIS) which was published by an equally unapprising media outlet, The Nairobi Star, stated that the attackers had taken shelter in the vast Boni Forest alongside their families; and that they were a distinct army within Al-Shabaab known as Jeysh Ayman. In reality, the attackers returned to Somalia after opening up a front in Lamu which provided Al-Shabaab militants with unhindered access to Lamu and Garissa Counties where they could launch attacks at will. And the Ethiopian who Escaped was also Killed….. The Slain Ethiopian who had escaped an earlier ambush at Beledweyne. Photo credit: Al-Kataib. One of the principles of Asymmetrical Warfare - according to SIF - asserts that the weaker party (in the conflict) should launch a ferocious attack on the enemy forces, using the elements of surprise and stealth to maximize its advantages; and then withdraw once it has achieved its tactical objectives. This ensures that minimal resources are used in an operation, besides forcing the stronger opponent to thin out its forces during attempts to pursue the withdrawing troops. Al-Shabaab jihadis withdraw from Leego. 1. Amar Osman Axmed – a member of the Hawadle sub-clan. 2. Dhaqane Abdullah Omar - a member of the Hawalde sub-clan. 3. Musab –a member of the Ishaaq Sa’ad Muuse sub-clan. 4. Ayoub Hassan Salad - a member of the Ayr sub-clan. As mentioned earlier, the inclusion of their clan identities is meant to demonstrate the pan-Somali nature of the Somali jihad. Regarding the fatalities suffered by AMISOM, the video states that more than 80 Burundian soldiers were killed; and Al-Shabaab displays the remains of about 70 Burundian soldiers. The Burundian government conceded to losing 50 soldiers in Leego; while SIF put the number of fatalities at 70 dead. Towards the end of the video, the jihadists string together three bodies of AMISOM soldiers, tie them to the back of a Technical and then drag the bodies along the dirt road. Bodies of Slain AMISOM soldiers strung together and dragged along a dirt road. Photo credit: Al-Kataib. Al-Qaeda or the Islamic State? The video contains speeches made by prominent Al-Qaeda personalities (most of them deceased) except for Dr.Ayman al-Zawahiri who presently serves as the Supreme Emir of Al-Shabaab with Abu-Ubaidah serving as the Chief Emir of the Jihadists in East Africa. This confirms the allegiance of Al-Shabaab to Al-Qaeda, and indifference to periodic (and sometimes persistent) appeals for Bayah(pledge of allegiance) from the Islamic State in Iraq and the Levant (ISIL). In a previous post published here, the author stated that Al-Shabaab, despite being firmly within Al-Qaeda's Fold, has consciously implemented a cautious policy of calculated neutrality towards ISIL in the Al-Qaeda – ISIL conflict. Al-Shabaab attack on the AMISOM base at Leego demonstrates enhanced capacity by the Jihadists to conduct successful offensive operations within an Asymmetrical Battlespace. The success of the attack and their triumph over Ugandan troops in Janaale town procures a bias of formulation and implementation of effective (and pragmatic) military strategies that synergize available combat potentials (mobility, operational flexibility, effective reconnaissance and the element of surprise) to ensure total kinetic victory in intense short-lived battles. The Burundian troops in the town adopted a “Garrisson Attitude” which greatly limited their knowledge of the terrain besides curtailing the effectiveness of their patrols – two factors which enables Amniyaat Units to insert espionage and reconnaissance units to spy on the base and survey the ground prior to the attack. In the video, voice synthesizers were used to obscure the voice of some of the militants; and this combined with the fact that there was no mention of Amniyaat Units demonstrates heightened need by Al-Shabaab to conceal vital details regarding its operational security, and tactical maneuvers. Al-Shabaab is far from being defeated as repeatedly (and errounesouly) stated by the US, Kenyan, Ugandan and Somali governments; and it is quite clear that Al-Shabaab has transformed itself into a hybrid force capable of conduction both conventional operations and guerrilla campaigns against its OPFOR (Opposition Forces). By dragging a quantitatively and qualitatively superior army into a long war of attrition, Al-Shabaab has been able to wear down its OPFOR as well as escalate the cost of the war beyond acceptable limits for its opponents; and in so doing, anticipate that the OPFOR will finally suffer defeat through exhaustion and demoralization. Iaccino, Ludovica (2 December 2014). “Kenya massacre: Al-Shabaab vows more 'ruthless attacks against occupation of Somali lands'” International Business Times. Retrieved 6 October 2015. Allison, Simon (3 September 2015). “Analysis: Al-Shabaab's revenge sparks another crisis in Somalia”. Daily Maverick. Retrieved 6 October 2015. Ahmed Roble, Muhyadin. “Al-Shabaab Exploits Kenyan Crackdown to Recruit Muslim Youth,” Terrorism Monitor 12:11 (May 2014): 7-8. Retrieved 6 October 2015. Masters, Jonathan; Aly Sergie, Mohammed. “Al-Shabab,” CFR Backgrounders (13 March 2015). Retrieved 6 October 2015. Musaji, Sheila (22 September 2013). “Al-Shabab are criminal terrorists not jihadis” The American Muslim. Retrieved 6 October 2015. Al-Kataib Media Foundation. “Avenging the Honor of Our Prophet- Storming the Burundian Crusaders’ Base Leego – Lower Shabelle”, (September 25, 2015). Lambert, Fred (14 June 2015). “Kenyan military: 11 al-Shabab militants killed in botched attack”. United Press International. Retrieved 6 October 2015. For a discussion of Al-Shabaab’s attacks during the 2015 Ramadhan Period, see: Nominal Analyst. “Al-Shabaab’s Ramadhan Offensive - Altering the Course of Jihad in East Africa”, Strategic Intelligence Files (June 2015). Retrieved 6 October 2015. Nominal Analyst. “Fall of Leego's AMISOM base – Primer to Al-Shabaab Offensive in South-eastern and Central Somalia”, Strategic Intelligence Files (July 2015). Retrieved 6 October 2015. Jamah, Ally (2 June 2015). “Al-Shabaab militants are cowards, says President Yoweri Museveni”. Standard Digital. Retrieved 7 October 2015. Museveni, Yoweri (27 April 2015). “Al-Shabaab Already Defeated”. New Vision Online. Retrieved 7 October 2015. Kriel, Robyn; Duggan, Briana (3 September 2015). “Military sources: Al-Shabaab attack in Somalia kills dozens of AU troops”. CNN. Retrieved 7 October 2015. Moritsugu, Ken (12 September 2015). “Ugandan leader blames own commanders for laxity in deadly Somali militant attack”. Associated Press. StrategyPage. “Somalia: A Nasty Ramadan Surprise”, Strategy Page (July 2015). Retrieved 6 October 2015. Weiss, Caleb (19 June 2015). “Shabaab claims to kill dozens of Ethiopian troops in southern Somalia”. The Long War Journal. Retrieved 7 October 2015. Eid-al-Adha (translated into English as the Feast of the Sacrifice) commenced in the evening of Wednesday, 23rd September 2015; and ended in the Evening of Thursday, 24th September 2015. 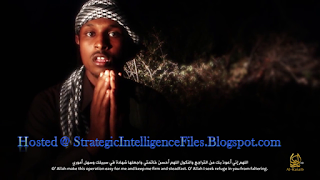 AlShabaab, through Al-Kataib, released the video on 24th Sepetember 2015. The Pontiff at the time of the publications of the caricatures which Osama is talking about (the Muhammad cartoons published by Denmark-based newspaper, Jyllands-Posten, in September 2005) was Pope Benedict XVI. Harley, Stephen. “Al-Shabaab’s Eid Message: the Leego Attack Video”, Our Man on the Horn (September 2015). Retrieved 6 October 2015. Scahill, Jeremy (10 December 2014). “The CIA’s Secret Sites in Somalia”. The Nation. Retrieved 5 October 2015. McCormick, Ty (2 July 2015). “Exclusive: U.S. Operates Drones From Secret Bases in Somalia”. Foreign Policy. Retrieved 6 October 2015. BBC (6 July 2014). “Kenyan coastal region of Lamu hit by deadly attacks”. BBC.com. Retrieved 5 October 2015. Onsarigo, Calvin (21 July 2015). “Al Shabaab seeks Coast Caliphate”. Nairobi Star. Retrieved 5 October 2015. Wabala, Dominic (13 July 2015). “Al Shabaab unit formed to cripple Kenya”. Nairobi Star. Retrieved 5 October 2015. Star Team (27 May 2015). “Confusion over al Shabaab attack in Yumbis town, one officer dead”. Nairobi Star. Retrieved 5 October 2015. Binnie, Jeremy (9 July 2015). “AMISOM to 'revitalise' campaign against Al-Shabaab”. IHS Jane's Defence Weekly. Retrieved 7 October 2015. Joscelyn, Thomas (6 September 2015). “Shabaab names new emir, reaffirms allegiance to al Qaeda”. The Long War Journal. Retrieved 7 October 2015. Kriel, Robyn; Leposo, Lillian (22 May 2015). “In video, Somali ISIS members court Al-Shabaab”. CNN. Retrieved 7 October 2015. Nominal Analyst. “Kenyan Engineers Advancing Technical Sophistication of Al-Shabaab’s IEDS as Amniyaat Activates Istishhadi Elements in Kenya”, Strategic Intelligence Files (May 2015). Retrieved 6 October 2015. Nominal Analyst. “Somalia – A Past Failed Jihadist War, Its Reincarnation, Counter-Terrorism and Fiat Democracy; and, Why al-Shabaab Still Remains Undefeatable”, Strategic Intelligence Files (July 2015). Retrieved 6 October 2015.